You know, just for a second or two. I'll make it quick. Promise. Those of you who've been reading here for a while know I rarely write about myself. I mean, with a husband, three kids--one of whom sent our world spiraling out of orbit with his prenatal CHD diagnosis--and the guise of overseeing homeschool perfection on a daily basis, it's not often that "mommy" makes an appearance in my stream of consciousness. Nothing personal, self; you're just not that interesting. I struggle. With life, with parenting, with marriage, with health, with friendships, with serving God, with serving others, with balancing life, with defining priorities... the list goes on and on. And, as they say, the struggle is real. Now I won't pretend for one second that I'm alone in any of these struggles. We are all fighting for our families and livelihoods while simultaneously fighting against the enemy and his efforts to steal, kill, and destroy. And while I know my God is bigger than any obstacle I find in the road ahead of me, I still call out this whole "being human" thing every now and then, and how unfortunate it can be at times. Here's the good news: I'm not going to rant on and on about all of the struggles because, let's face it, your interest level and attention span (not to mention my will to vent) isn't conducive to such extemporaneous dialogue. So I'll be moving right along now and focusing in on one key area: my health. I'm going to share a tiny gem here that very few people are aware of: I was diagnosed with a fairly common disorder called Hypothyroidism waaaaaaaaaay back in high school (waaaaaaaaaay back = the 90s. Like, the 1990s. To confirm, Me = Dirt). The diagnosis didn't mean much to me at the time. I didn't have any symptoms, but was told my thyroid levels were whack and that I'd need to take a daily pill for the rest of my life. Yay? Fast-forward about a decade (geez I'm old! ), and you'd find the newly-married hubs and I looking to populate the world with our sure-to-be genius offspring. A positive pregnancy test and a vat of joy and excitement unfortunately ended in an early miscarriage. Two months later, another positive pregnancy test and optimistic excitement also ended with the same unfortunate result. We were stunned. Disappointed. Confused. Just to name a few. With a little bit of research, we discovered the importance of hormone levels in successful pregnancies. Any guesses on which gland is responsible for secreting hormones? Spoiler alert: it's the thyroid. With a quick online search, you'd find research concluding that "hypothyroidism has a statistically significant relationship with recurrent pregnancy loss in the first trimester." Of course you all must know by now that I successfully birthed three of those supposed genius offspring. This was only possible with monitoring thyroid levels during each trimester of pregnancy, adjusting my daily maintenance medication as needed. It wasn't a terrible inconvenience, but it certainly added a new level of stress during pregnancy since we were very aware of what would happen should those levels get too out of whack. So we've established that (A) the thyroid is important and (B) it sort of plays an important role in pregnancy. Got it. Wanna know another side effect of hypothyroidism? I knew you would. I could wait here while you google it, but I'll save us both the time: Weight gain. Can we all just agree to have a thyroid issue to explain away the weight gain? Seems legit to me! Ugh. But really, this is where my latest health struggle lies. In December of last year, my endocrinologist tested me for Hashimoto's Thyroiditis disease, and the results were positive. This wasn't terribly unexpected, and in the end doesn't really impact how I will be treated; however, it did explain the underlying issue of my hypothyroidism. Apparently, our dear friend Hashimoto's disease is a condition in which your immune system attacks your thyroid... you remember, that lovely little gland responsible for producing hormones that coordinate many of your body's activities? All the activities. Like the weight. And the gaining. Oh the gaining. Y'all know how frustrating managing one's weight can be, especially as one's age grows closer to yet another round number... and how difficult it can be when you make everything else a priority rather than properly caring for yourself. There are just so many things/people vying for your attention, amiright? All. The. Things. But I digress. Well maybe not just yet. Let's take a look at a little graph here for a bit of a visual aid, shall we? In the effort of full disclosure (thus empty embarrassment? ), my actual weight in numbers shall not be publicized here on the interwebs because, really, right? 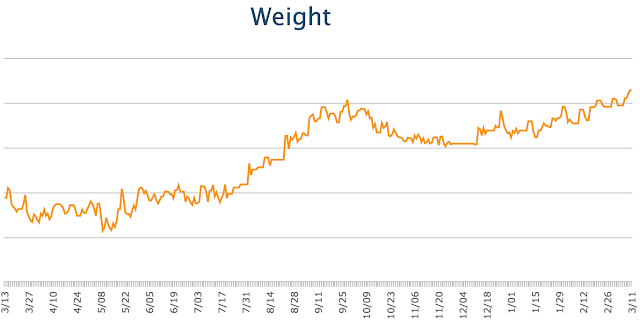 But I will disclose that the horizontal gray lines on this here graph each represent ten pound increments. I'll await your gasping and/or calculating of the gray lines. I wish I had the ability to share further back than just a year, because you'd see that graph all. over. the. place. It's insane. And frustrating. It doesn't seem to matter what I do--diet, exercise, exorcism of my sweet tooth, et cetera. My attempts are futile as it seems my body has its own interests in mind, which, apparently, is holding on to every ounce of weight to the utmost conceivable degree whilst searching out it's next dozen pounds. I was hoping to get things figured out but oh, the tweaking. The tweaking of my medication is driving me certifiably insane. The consolation I find is that I'm no longer depending on a primary care physician to make their best educated guesses on where my levels should be; I've started seeing an endocrinologist whose job it is to know how to bring these numbers into submission. But even still, we continue to tweak my medication levels in an attempt to find the right balance that accounts for my immune system's evil desire to attack my perfectly innocent thyroid. Will we ever get there??? I can hope so. I believe so. But we aren't there yet. And that means I continue to do my best at managing the symptoms of this disease, which hands-down, my favs have to include the weight gain, fatigue, and stiffness/swelling in my wrists < - - - - note: not the best situ for a computer-wielding, piano-playing, cake-decorating, overall significant wrist-using individual. I'm guessing it's quite likely that one or more of my faithful blog readers can identify with the life of hypothyroidism, and if so, I'm hopeful you're getting the treatment you need to be a productive (albeit tired) member of society. And I really hope y'all don't mind me being real here about this. I'm so grateful this "battle" of mine is as insignificant and unimportant as it is... I'm fully aware that many are suffering with much more serious and life-threatening diseases. But since this is my blog after all, I decided to take a cathartic moment to unload a bit of stress and be honest about life. Because I'm learning that it's okay to share a struggle -- whether big or small -- as we all go about doing life together, supporting one another, and encouraging whenever possible. And I pray in exchange that you will give me the same opportunity to love and support and encourage you with whatever life has thrown at you. I'm here and I know how to listen and pray! Oh, I am right there with you!!! I was diagnosed at 32 and for the first few years I dealt with it ok. But the last few, ugh! It's awful! I just started seeing a functional medicine Doctor so I am hopeful she can help!